Do Your Feel Comfort With a 20,000+ Dow? The Dow has dropped a bit in recent days but do you feel comfortable with a Dow in the 20,000 range? I recently answered that question when I spoke at a seminar in Tampa hosted by ENR Asset Management. I have attached a portion of the presentation I made. Here is the 44 minute presentation I made at the seminar. The balance of the presentation is available to Pi subscribers. Details on how to subscribe are below. A special value investing tactic makes high risk, high profit speculations safer and more profitable. For example in 2015, a 10,000 pound loan (in British pounds at $1.52 per pound) was used to purchase 1,091 shares of the silver ETF SLV. Those shares rose to be worth $20,421 by 2016, a 34.34% additional profit. A 10,000 pound loan (the pound was $1.52 per pound) purchased 1,091 shares of the silver ETF SLV. Those shares rose to be worth $20,421 by 2016, a 34.34% additional profit. From 2015 to 2016 the pound dropped from $1.52 dollars per pound to only $1.39 dollars. The 10,000 pound loan that had worth $15,200 in 2015 only required $13,900 to pay it off in 2016. All this profit was made on the 10,000 pound loan. No cash was required on the investor’s part. The entire $6,521 was pure… extra profit. This example came from our Purposeful investing Course (Pi) which studies three main layers of value investing tactics in real time. Tactic #1: Diversify equally in good value developed and emerging stock markets. Tactic #2: Use trending algorithms to increase, reduce or hold positions in these markets. Tactic #3: Add spice to a portfolio speculating in precious metals, when their price is under “ideal conditions”, using leveraged, low value currency loans. An “ideal condition” is a rare distortion in an economic fundamental that history has shown “almost always” corrects itself. The words “almost always” indicates that there is risk. There is risk that a basic fundamental has changed and the distortion will not correct in any targeted period of time. Or a new fundamental has shifted dynamics to such an extent that the distortion never corrects. There is always risk. Profit is the reward for taking that risk, but there is always a chance of loss which is why the third layer speculation is to be used like a spice… sparingly. Pi looks for several ideal conditions in precious metals using the price of gold based on over 40 years of speculation in precious metals. The first condition is gold’s price to inflation. Gold is the anchor of the strategy but its ricing is perhaps the most speculative since a meaningful inflation rate is hard to define. Gaining a true perspective on gold’s value is difficult because the price of gold was fixed for many years. The gold price was fixed at $35 an ounce at the end of WWII and this fixing did not take into account the huge inflation this conflict created. This also impacts any accuracy in understanding what the real the price of gold should have been at the end of the war. Statistics can be misleading. In the report Platinum Dip 2018 there is an analysis of inflation. These factors distort the accuracy of the picture. How much is gold really worth now? What is its real value? This is truly THE golden question. At this time the magic number we sue for gold is $1,225 an ounce. If gold’s price is much higher than $1,225, than the Silver Dip or Platinum Dip are not in an ideal condition. When gold is priced ideally, then there are several ratios that can alert us to an ideal condition. The first ratio is the gold to silver ratio. When the gold silver ratio reaches 80 we consider speculation in silver to be ideal (if gold is ideally priced). 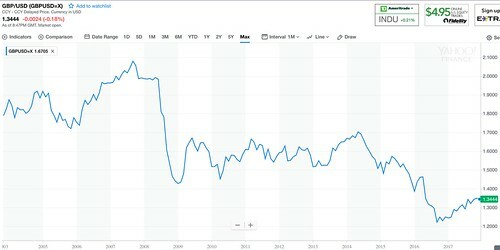 This value indicator is simple because the gold silver ratio is rarely as high as 80, only three times in 36 years as the chart below shows. The spread was over 80 when we issued the original Silver Dip in the 1980s. 30 years later ideal conditions coincided again. The chart above shows how the spread was shooting towards 80 when we issued the Silver Dip 2015 report. The spread hit 80 in 2015 and again in March 2016, but we can see from the chart above that a drop in the spread was on its way. The trend was for a continued lowering of the spread as silver’s price rise was much stronger than gold’s throughout 2016. This chart below from infomine.com shows the trend clearly. Another ratio we watch is the gold to platinum ratio. When the price of gold rises above the price of platinum, platinum’s price is at an ideal condition. Platinum is a good value when it sells for less than gold and gold is close to our below its fair price ($1,225). As the chart below shows, platinum costs more than gold more often than not. The fundamental reasons for platinum’s high price, including platinum’s supply scarcity support this. 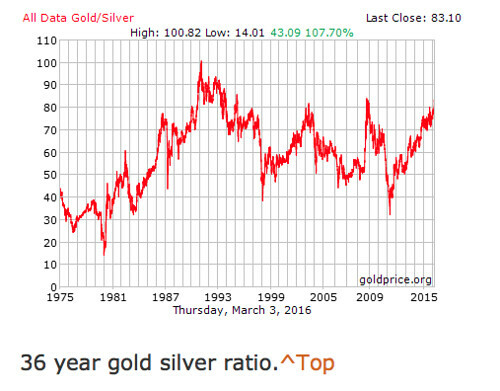 The chart below from Kitco.com shows the gold-platinum ratio. The ratio is the red line and right axis. The price of gold is the yellow line, left axis. The price of platinum is the blue line, left axis, from 1975 to May 13, 2016. 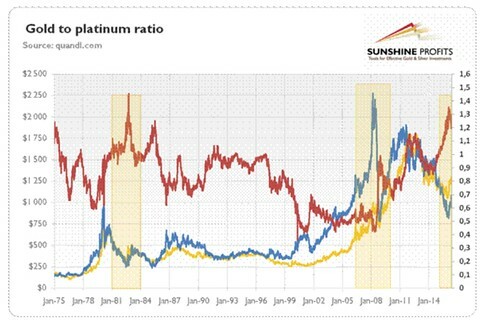 Notice how each time the gold-platinum ratio (red) has spiked, 1975, 1982, 1985, 2002, 2009, shortly after the price of platinum (blue line) has skyrocketed shortly after. 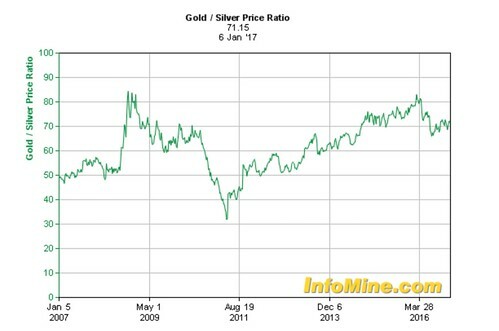 The gold-platinum ratio was at an almost historical low when this report was written and the “Silver Dip 2017” recommended a shift from speculating in silver to speculating in platinum. The 2017 report recommended leveraging the platinum ETF “ETFS Physical Platinum Shares” (Symbol) PPLT. The spice. This type of speculating is not done on its own, but as an adjunct that enhances an existing equity portfolio. The portfolio is used as collateral for a loan that is invested in the metal with an “ideal condition price”. Let’s examine how a speculation in silver (based on a gold silver ratio’s ideal condition) increased the profits of a portfolio of good value developed and emerging market equity ETFs. This study looks at the $100,000 invested in a portfolio we began tracking in our Pi course. The portfolios were started September 2015 (591 days before this study or 17 months ago). 70% was invested in ten good value developed market ETFs and 30% in 10 good value emerging market ETFs. This is a list of the shares in the Developed Market Portfolio. This is a list of the shares in the Emerging Market Portfolio. The good value portfolio was up 4.64% (a gain of $3,248) since inception and the emerging market portfolio is up 6.72% (a gain of $2,016). A portfolio of these shares with an original investment of $100,000 invested 70%-30% after 591 days (February 2017) was worth $105,267, a 5.26% gain. In this study we examine the change in performance when an additional $10,000 was risked on the iShares Silver ETF (Symbol SLV) beginning March 2016 when the gold silver ratio broached 80. The price of SLV was $14.01 in March 2016 and is currently $17.06. Let’s examine profits under three different exit strategies. Exit strategy #1: No exit. The $10,000 was worth $12,163 at the time of this study (February 2017). Exit Strategy #2: Exit when Tradestops issued a Stop Loss signal November 2016 at a price of $16.07 per share. The $10,000 was worth $11,457. Exit Strategy #3: Exit when the Gold silver ratio dropped below 70 on January 2017. The $10,000 was worth $11,365. The overall portfolio performance was improved in each situation. Exit strategy #1: Profits increased from $5,267 to $7,430. A 10% increase in the portfolio added a 41% increase in profit. Exit Strategy #2: Profits increased from $5,267 to $6,724. A 10% increase in the portfolio added a 27% increase in profit. Exit Strategy #3: Profits increased from $5,267 to $6,632. A 10% increase in the portfolio added a 26% increase in profit. All of these additional profits were gained without a penny of extra investment. All the profits came from loans that were invested in silver. The other benefit beyond profit is safety from time. When leveraging investments, time is most important. Because leverage is secured by the entire portfolio rather than just the additional investment, the odds of a margin call are almost nil so the investor gets to determine how long the investment will have to mature. Let’s take an example of the good value Pifolio above. In this study the loan was $10,000. The collateral is not the $10,000 investment in silver, but the entire portfolio which is now $115,267 ($105,267 plus the $10,000 in silver). This means (if the rules of the lender requires a two to one loan ratio) that the portfolio would have to drop around 75% before there would be a margin call. Such a loss is highly unlikely. This margin has as much time as is needed to let fundamental forces work through the market. Any profit gained comes without adding a penny to the portfolio. The most important elements of making good investments are price and time. There is always something about investments we won’t know, but the one thing we can trust is that investments purchased at the right price, and given time, have the highest odds that profits will flow. Recently the silver ETF iShares Silver Trust (symbol SLV) was priced 18.62% below the highest close of $19.60 from last August. The mathematical system we track created a stop loss price of $16.18, showing that this precious metal moved into selling territory. Now the share price is in the $15 per ounce range. We Use Math to Spot Value. Whether one likes to trade or invest and hold, math based financial information works better than the spin, rumor and conjecture of the daily economic news. Mathematical based investing can put us on a solid path to everlasting wealth that is not easily diverted by the daily drama that seems to be unfolding in the modern world. For example, our Purposeful investing Course teaches three mathematically based routines that have been proven to out perform the market over time . The first routine in the course is the quarterly examination by Keppler Asset Management of 43 equity markets and analysis of their value. This makes it possible to create a base portfolio of Country ETFs based on basic value. This passive approach to investing in ETFs is simply to invest in Country ETFs of good value equity markets. For example, Keppler’s analysis in 2017 shows that the “Good Value Developed Market” Portfolio is twice the value of a US market index fund and a much better value than any of the other indices shown. These are based on the cornerstones of value, price to book, price to earnings and dividend yield (except the European dividend yield). The Good Value Developed Market Portfolio offers even better value than the Morgan Stanley Capital Index Emerging Market Index. History shows, that over the long run, math and value drive the price of markets. Using math makes it simple, easy and inexpensive to diversify in the predictability of good value. The second tool Pi provides is a way to actively monitor and shift the good value markets using trending and volatility algorithms. These algorithms allow us to trade good value markets through downtrends and upticks to increase profits in a diversified even more. These trending algorithms use the math that spotted the current condition of silver. Use math to spot distortions that create ideal conditions for speculation. Pi teaches the strategy of speculating in metals when speculative conditions are absolutely ideal. The Silver Dip relies on a really simple theory… gold should rise about the same rate as other basic goods and the rise and fall of silver’s and platinum’s price should maintain a parity with gold. Our math based study has created an ideal price for gold and though its trending up it has passed the good value level we use. Gold is still okay, but not a bargain any more. Value investors only seek bargains. When “Silver Dip 2017” was written profits on silver had been taken. Platinum conditions are ideal for 2018. Since 2014 the price of platinum has fallen below the price of gold and at the beginning of this year reached a historical low. The distorted gold platinum spread suggests that platinum is a very good value so we are updating our dip report, and it will be the “Platinum Dip 2018”. How to use theDip strategy in platinum without adding a penny of cash if you already have investments. How to invest as little as a thousand dollars in platinum if you do not have a current investment portfolio. Why this is a speculation, not an investment and who should and should not speculate and how to limit losses and take profits. Three reasons conditions are better for a Platinum Dip now. Three different ways to invest and speculate in gold, silver or platinum in the US or abroad. The “Platinum Dip 2018” also contains four matrices that calculate profits and losses so investors can determine cut off positions in advance to protect profits and/or losses. The report also looks at how to switch time horizons for greater safety. The first way the Dip adds extra performance is with leverage. The second way to enhance performance is to maintain the leverage in poor value currencies. Choosing which currencies to borrow is almost as important as choosing which metal to invest in. The examples in this report have shown loans made in British pounds. Other times it has been better to borrow Japanese yen, Swiss francs, once Mexican pesos. Currently the best currency to borrow is US dollars. The Platinum Dip 2018 report reviews each currency and which is best to borrow now and what to watch for. Sometimes it is best to borrow a second currency and pay off the initial loan in mid stream. Rising interest rates make the US stock market highly dangerous in the short term. “The Platinum Dip 2017” shows how to create a safe, diversified good value stock portfolio and use it to generate much higher returns with a little controlled speculation in platinum. Learn how to get platinum loans for as low as 1.58%. See why to beware of certain brokers and trading platforms, how to choose a good bank or broker and how platinum profits are taxed. The report includes a complex comparison of gold and silver with other costs of living from 1942 to today to help determine the real value of gold, silver and platinum. Finally, learn why and how to use advisers to manage profits from the gold and silver dips. Current circumstances could cause the price of platinum to rise rapidly at any time. Do not delay reading this report. The Silver Dip sold for $79 in 1986. Due to savings created by online publishing (we eliminated the cost of paper and postage), we are able to offer this report for $39.95. Get the Silver Dip 2017 FREE when you subscribe to the Purposeful investing Course. Act Now. Subscribe to the first year of the Personal investing Course (Pi). The annual fee is $299, but to introduce you to this online, course that is based on real time investing, I am knocking $102 off the subscription. You also receive the $39.95 report “Silver Dip 2017” FREE. Enroll in Pi. Get the first monthly issue of Pi and the three reports right away. #2: I guarantee you can cancel your subscription within 60 days, and I’ll refund your subscription fee in full, no questions asked. #3: You can keep the three reports as my thanks for trying. Subscribe to a Pi annual subscription for $197 and your initial 160 page online introduction and the regular bi weekly emailed updates for a year. Investing in Green Investments has been created great success in recent years. Big problems create big opportunity. There are few problems the world faces as big as protecting the environment. This problem creates huge profit potential in green investments. Plus the risk of a new terrorist EMP attack could create a new international investment era that accelerates green investment potential especially in the field of non grid alternative energy. We have proven the potential of green investments with our Green Portfolio that rose 266.30% in the first year (2007 to 2008) that Jyske Bank’s staff created and we tracked. There is a lot of focus these days on the climate changes and the “Green Energy” solution. Our capitol Copenhagen will actually host the UN Climate Change Conference (COP15) in December 7-18th 2009. US President Barack Obama and his Chinese counterpart Hu Jintao have committed themselves to strive for a wide consensus and a successful Copenhagen climate change conference. According to Xinhuanet, both parties expressed the wish that the two countries should set up common targets and carry out constructive, practical cooperation in developing clean energy and addressing climate changes. Countries in Asia have been using a large part of their stimulus packages on “Green solutions.” South Korea has spent up to 79% and China has used 34% of the above stimulus package on investments in green technology. They have at the same time announced, that they intend to be a leading player in Energy Technology. At the same time India is investing massively in solar and wind energy. Therefore, these investments in “Green Energy” will be a driving force on future growth in the area. We believe that the “climate aspect” has to be integrated into future investments, and that such a strategy can offer good returns. We suggest investing in iShares S&P Global Clean Energy Index. This ETF aims to track the S&P Global Clean Energy Index and offers exposure to 30 of the largest publicly listed companies around the world that are involved in clean energy related businesses. The index is comprised of a diversified mix of Clean Energy Production and Clean Energy Technology and Equipment Providers companies. 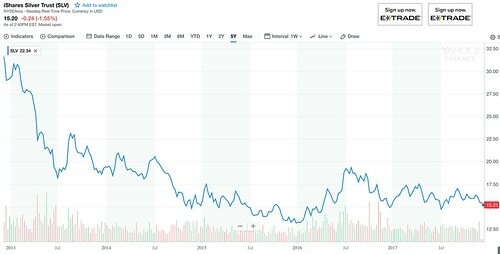 iShares S&P Global Clean Energy Index. is traded on the New York Stock Exchange (code ICLN). This ETF tracks the S&P Global Clean Energy Index and generally invests at least 90% of its portfolio in shares that are in the index. 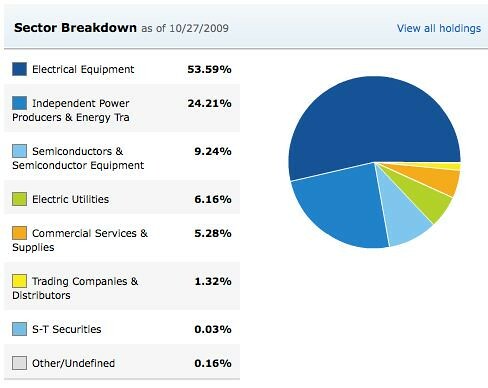 Here is a sector breakdown of the fund. The current Price to Earnings Ratio is 23.39 and Price to Book Ratio 2.32. The management fees are 0.48% of assets. Big problems create big opportunity and the risk of a new terrorist EMP attack generates a bigger problem that could create a new international investment era and extra profits with green investments. The S&P Global Clean Energy Index may gain extra profit from this fact. Join us at our upcoming courses and tours on international and green investments. Here are details about International Investments Major Market Valuations for August 2009. 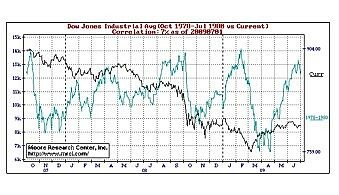 At our July 2009 international investing seminar, we reviewed the Dow’s previous 16 year down cycle which ran from February 1966 through August 1982. Here are delegates at a local winery for a wine tasting after the course. During that seminar we saw that in the first 12 years of that period, 1966 to 1977, the Dow dropped 1% overall in 135 months. Then we compared the similar period in the current Dow downside which is from 1998 until May 2009. The Dow had also dropped 1% in 135 months. Then we looked at three charts comparing the Dow’s performance over various two year periods to the period July 2007 to July 2009. We viewed how the Dow appears to be entering the 12th year of a 15 to 17 year down cycle that began in 1998. We compared the last two years of this cycle, with the equivalent period in the 1966 to 1982 bear cycle. 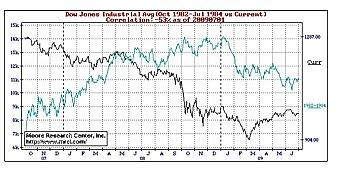 The chart below from Moore Research compares the Dow from 1976 through 1978 with the same time to July 2009. The Blue line is what happened in the equivalent period in the 1970s to now. Then we looked at what might happen in the next two years. Ignore the black line which shows the Dow for the last two years. This should not correlate with the next two years period. This suggests that in the next two years, we’ll see a lot of sideways motion with some severe drops. The next chart suggests that between 2011 and 2014 we’ll see even more severe drops. Again ignore the black line. This represents the Dow over the last two years and has no bearing on these periods. The blue line is what history suggests the Dow might act in the years ahead. Down… down… down… until late in the two year period when the bull finally begins. Then the bull trend continues over the next two years. According to our 35 + or – year wave theory some great new innovation should come along around 2014 and ignite the next 15 to 17 year bull in 2013 or 14. The steam won’t really pick up till about 2016… or even a bit later. 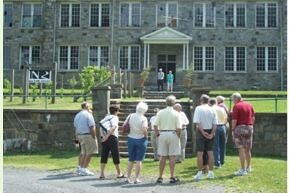 This will be good news for retiring boomers who manage not to be wiped out from the next half decade of sideways and downwards motion. This led us in the seminar to see seven places to invest now. This message focuses on value markets and reviews Michael Keppler’s just released three month Major Market Value Analysis. In my Spring 2009 edition, I wrote that Benjamin Graham’s margin of safety indicates that much better times may lie ahead for global equity investors. I was not aware, however, that such a powerful turnaround was underway. After seven consecutive negative quarters, global equity markets had in the second quarter 2009 their sixth best return since inception of the MSCI Indices at the end of 1969. The Morgan Stanley Capital International (MSCI) World Total Return Index (with net dividends reinvested, December 1984=100) advanced 16.5 % in local currencies, 20.7 % in US dollars and 14.3 % in euros. All markets covered here advanced in the second quarter. Singapore (+39 %), Hong Kong (+35.8 %) and Spain (+29.3 %) performed best last quarter. (+11.2 %) had the lowest returns. Hong Kong (+35.1 %), Singapore (+33.4 %) and Sweden (+23.8 %) fared best. Germany (-1.5 %). The United Kingdom (-1.3 %) and Switzerland (+0.5 %) came in at the bottom of the performance range. 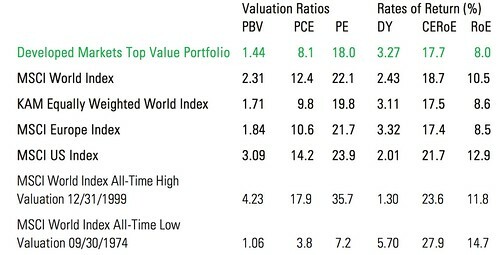 Year-to-date, the Top Value Model Portfolio is up 13.3 % in local currencies, 17.8 % in US dollars and 16.7 % in euros. These results exceed the benchmark returns by 8.5, 11.4 and 11.3 percentage points in local currencies, US dollars and euros, respectively. There were two changes in our performance ratings last quarter: Hong Kong and Belgium were downgraded to “Sell” from “Buy”. The Top Value Model Portfolio currently contains the following six “Buy” rated countries at equal weights: Austria, France, Germany, Italy, Singapore and the United Kingdom. Our current ratings suggest that these markets offer the highest expectation of long-term risk-adjusted returns. the last three months our expectation of the index level in 3 to 5 years declined from 4,055 to 3,852, which in combination with the strong price appreciation over the last three months leads to a drop of our current estimates of the annual price appreciation over the next 3 to 5 years to 20.7 percent. I show these numbers with the usual caveats: Forecasts are dangerous, particularly those about the future. Keppler’s analysis shows that low value markets are: Canada, Belgium, Denmark, Hong Kong, Switzerland and USA. Neutral value markets are Australia, Japan, Netherlands, Norway, Spain and Sweden. It is interesting to show that Keppler’s projections for value investments shows appreciation into 2014. History however suggests that equity investments may be subject to a lot of turmoil for the next few years. The down periods will create exceptional value if you can ride though the storm and hold on medium to long term. The volatility will also create some trading opportunities for those who are qualified to buy and sell shorter term. I am especially cautious now. See why at International Investments Warning. You can see several ideas on what to do now at our password protected site as a Multi Currency Portfolios Course subscriber.